Two buildings dominate the Architectural scene in Dubai; the first one being the World's tallest building "BURJ KHALIFA" and the second one the "BURJ AL ARAB", known as the Worlds only 7-star hotel. The latter has dominated the Jumeirah beach for more than 15 years and hasn't lost its popularity. The hotel sits on a small man-made island and is connected to the mainland with a 300 m long bridge. I'm often asked about the "tennis court" on the top of the building...Let's break the myth. The round structure at the top of the 320 m tall (same height as the Eiffel tower) building, is actually a helicopter platform. It was changed into a one of tennis court in 2005 when Roger Federer and Andre Agassi were invited to play a few rounds. A video of the event can be found here. 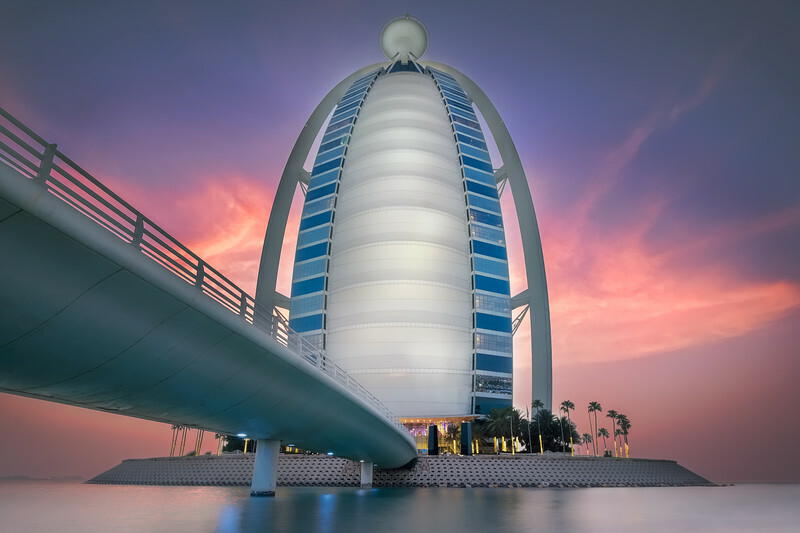 Over the years, I've shot the Burj al Arab (Tower of the Arabs) from a variety of angles, but shots with the bridge in the frame are a bit harder to get. The image which I captioned, "The bridge to luxury", consists of three shots blended together through Luminosity masks in Photoshop CC. A technique I've started learning as a summer project, with the help of the guys at goodlight.us . 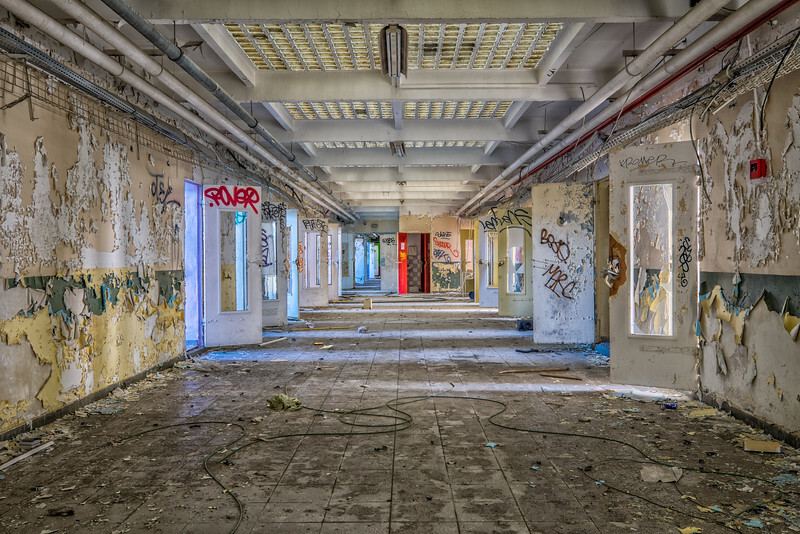 The technique allows for a much more realistic look compared to a classic HDR development. As the sky turned purple/orange for a very brief moment during the blue hour, I shot the darker frame which then allowed me to edit the photograph as I personally witnessed it! Even though, I've seen the Burj al Arab hundreds of times, it remains a building that never bores me. A collection with some of the images shot over the last 13 years can be found here. It is quite rare for an image to make it directly into my portfolio, but I believe this one deserves a place in the ARCHITECTURAL section. Remember: "We shape our buildings and thereafter they shape us" - Winston Churchill. 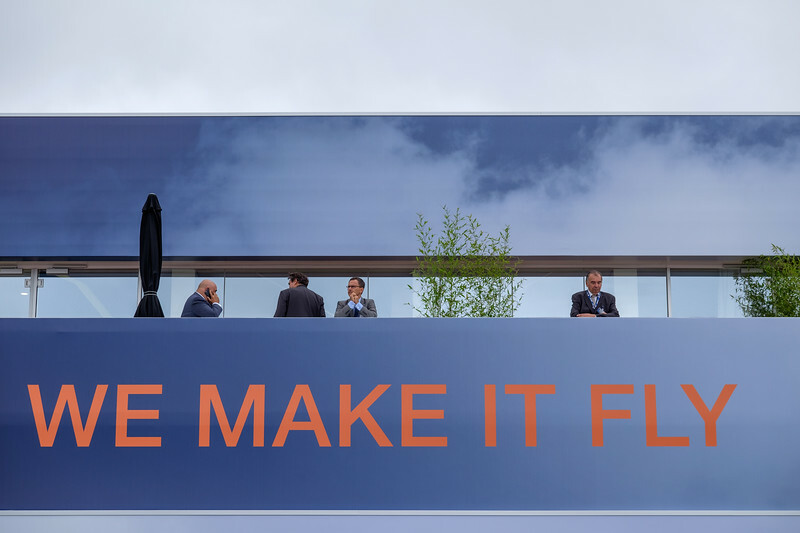 Last week, I attended the Worlds Oldest Airshow, officially called the "Salon International de l'aéronautique et de l'espace - Le Bourget", it is often referred to as the "PARIS Airshow". 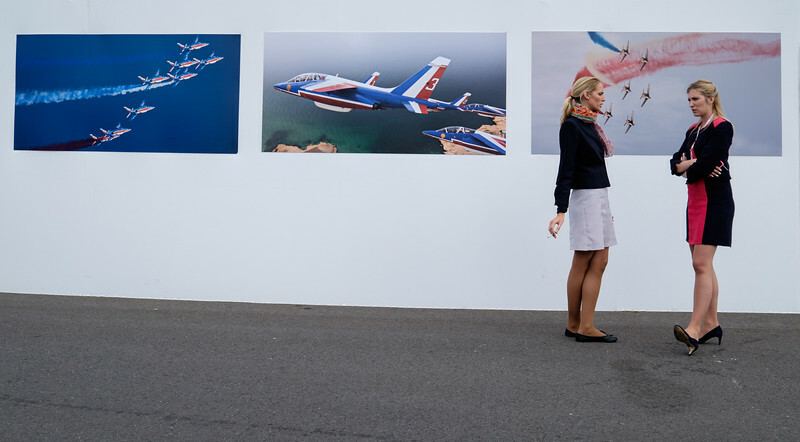 To me the show is much more an "Aviation fair", rather than a classic airshow; it is all about the business side of aviation rather than the pure love of flying which is often seen in classic airshows... Having said that, it is still a happening and interesting event. The weeklong show is held every two years (odd) at the end of June, with the first 4 days being reserved for professionals. The last three are open to the general public and have a more varied afternoon flying display. 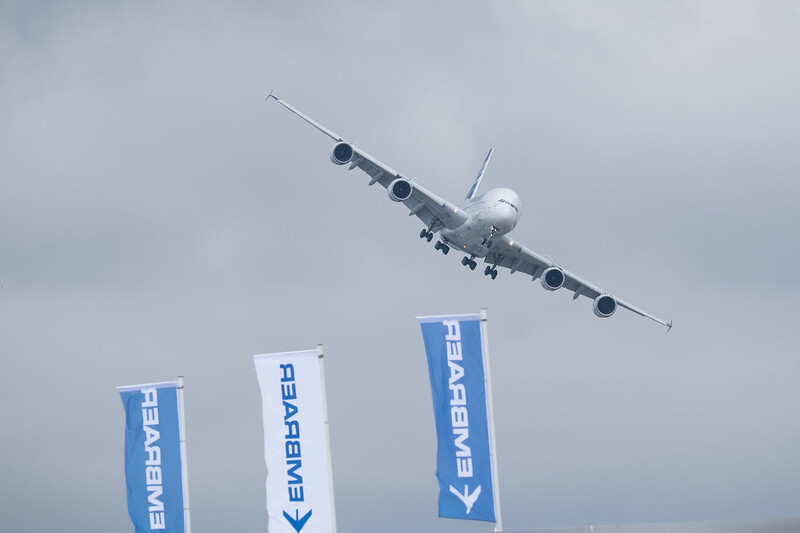 The first Paris airshow was held in 1908, only 5 years after the Wright brothers first flew. Beside a few obvious breaks during both World War I and II, the show has been held pretty much non-stop every second year and was on its 51st edition. 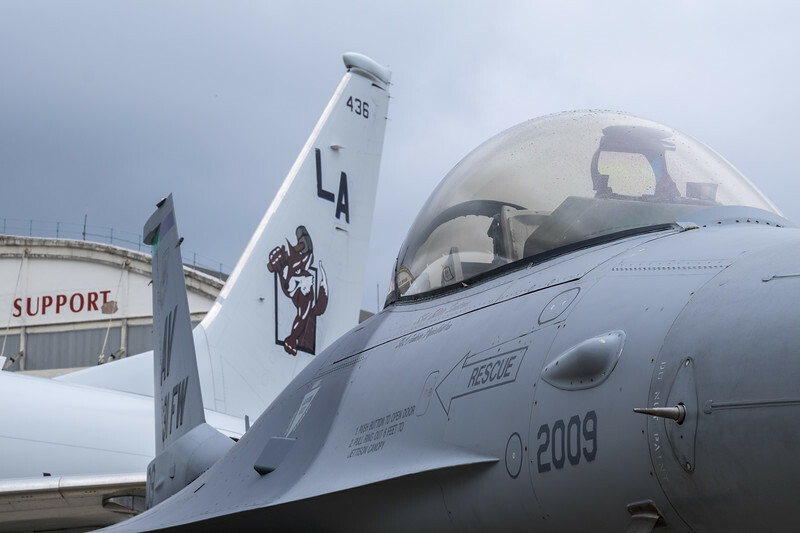 Also taking place during the odd years, another similar event is held in my neck of woods; the Dubai Airshow which this year takes place between the 8th and the 12th of November and has been growing exponentially since its start in 1989. During the even years, two similar shows are being held in both Berlin (Germany) and Farnborough (UK). 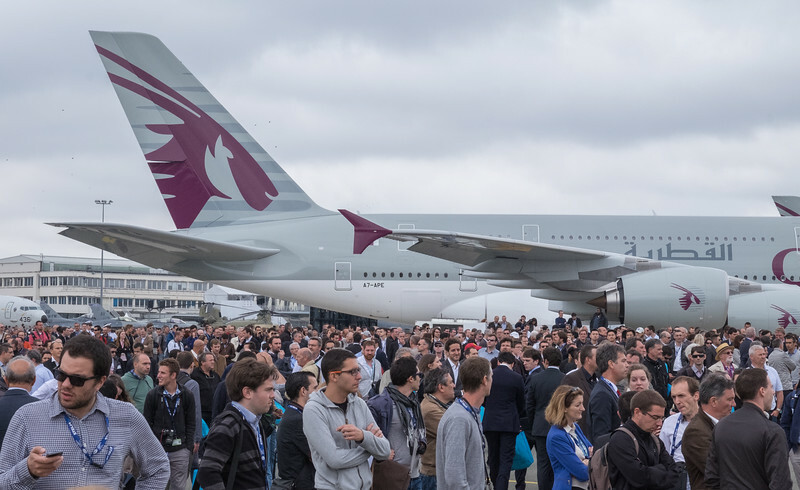 With over 2000 exhibitors and more than 350.000 visitors, the Paris Airshow is the second largest aviation event by visitor numbers. Airventure-Oshkosh taking first place with more than half a million people on the grounds during the weeklong event. 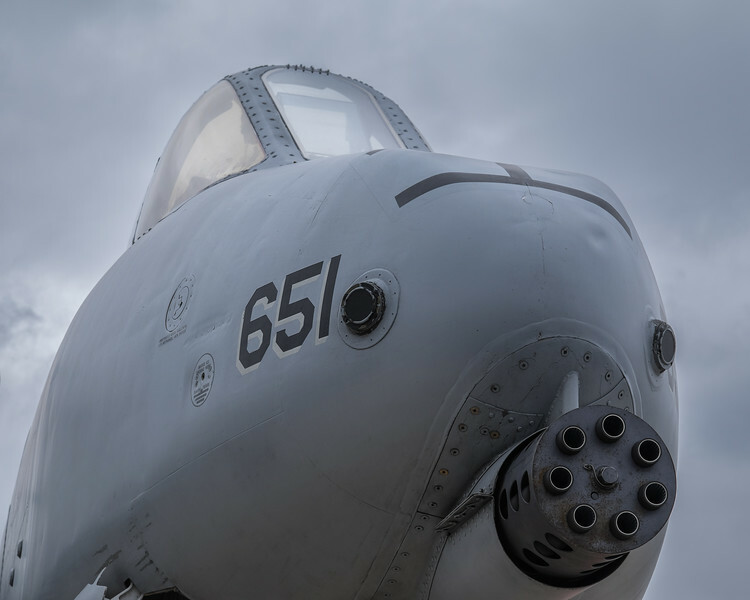 Beside, Airventure is of course a very different type of event and is rightly called; "The Worlds Greatest Aviation celebration". If all goes well, there is a good chance I'll make it back to Oshkosh (WI) this coming July! 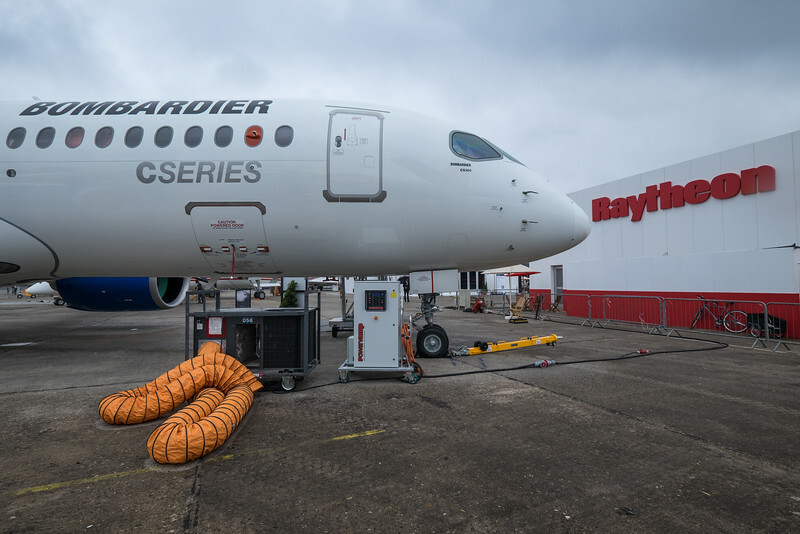 As stated before, it is all about the business side of Aviation in Paris; with most companies working in the Aviation field being represented, from the large manufacturers like Boeing and Airbus to the smaller companies making aviation springs, bolts and nuts; the Paris airshow has it all! 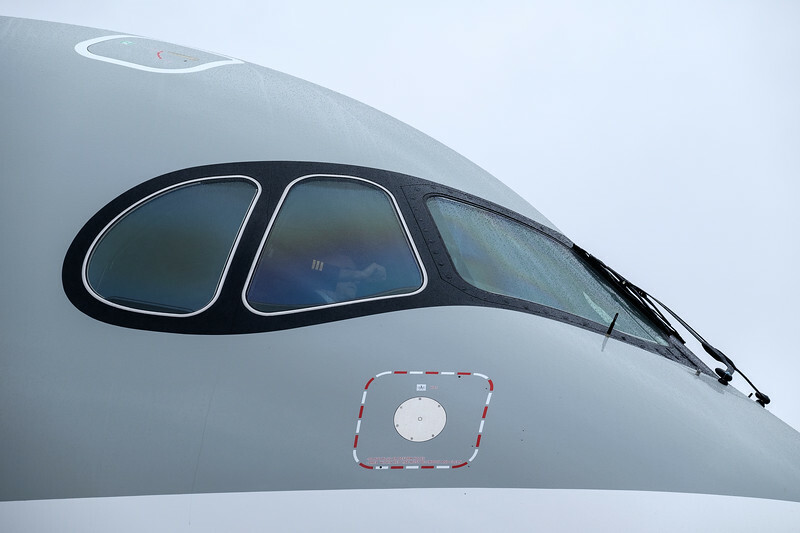 New aircraft types are frequently first shown at Paris and announcements of new project launches are often made during one of the many press conferences. 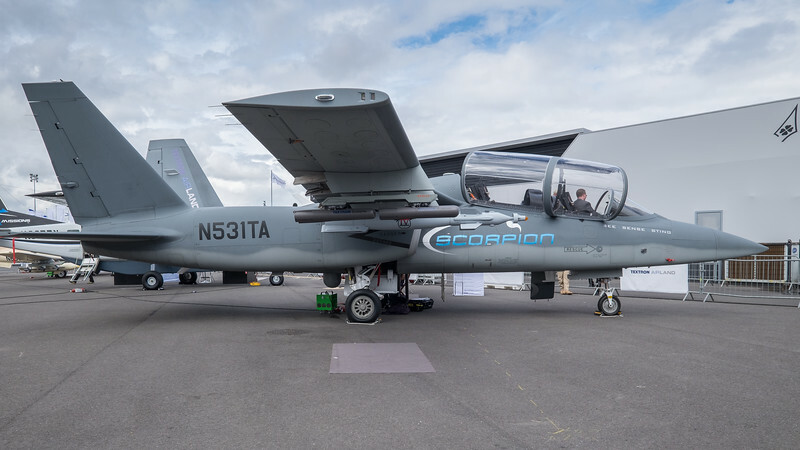 and the Scorpion light attack and reconnaissance aircraft built by Cessna. 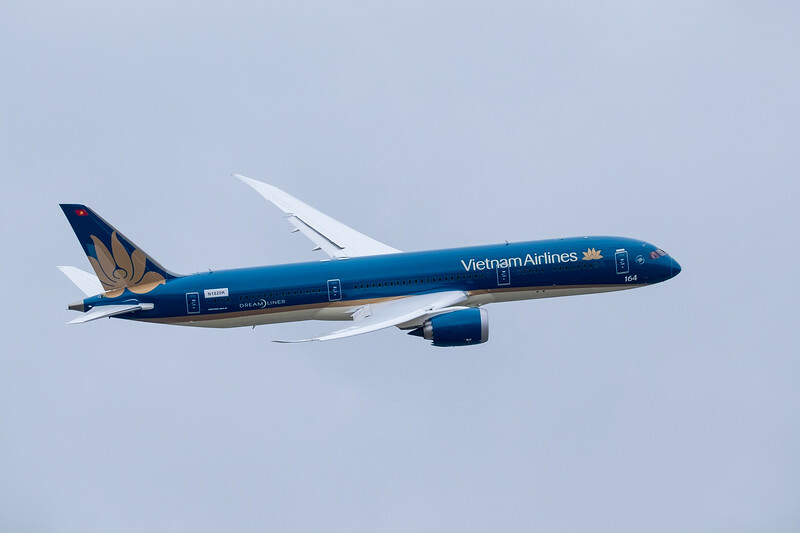 Airlines often officially order their new aircraft at shows like Paris and are then sometimes rewarded by the manufactures showing their new hardware at the show in the respective airline livery. 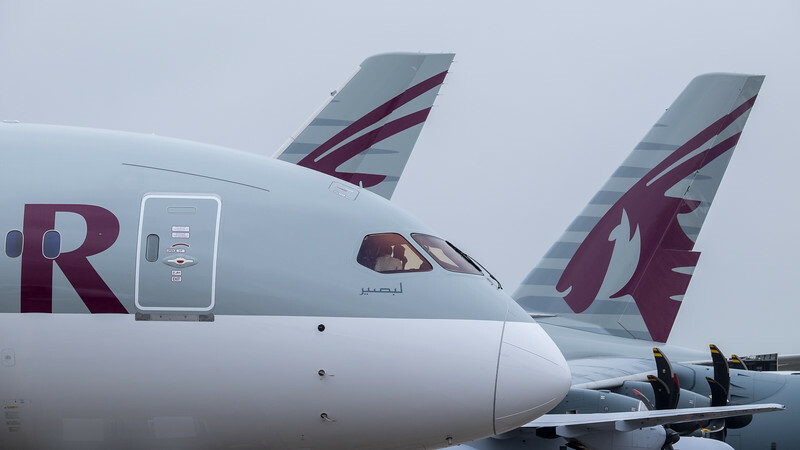 This was the case for Qatar airlines which had a Boeing B-787 and both an Airbus A350 and A380 at the show. Great marketing! 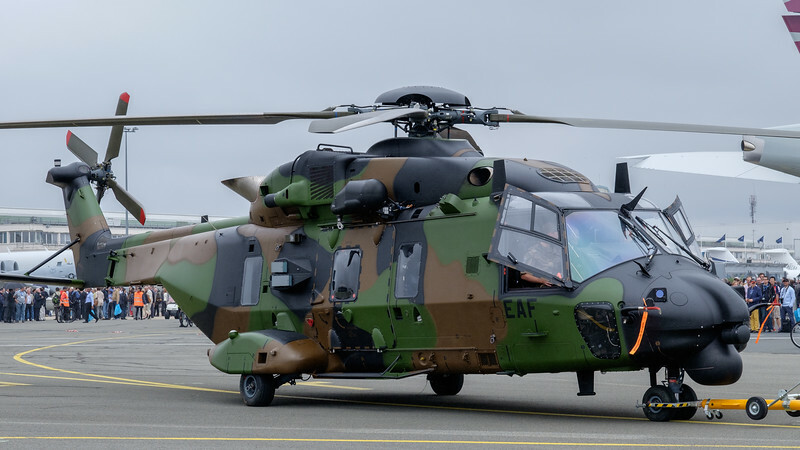 As the show is also a military event, a lot of the worlds governments come to Paris to check out what the latest and greatest from the aviation defence side. Unfortunately the weather wasn't that great on the Thursday I was there, making for a "limited flying display" and some challenging photography. Having a weather resistant camera and lens (FUJIFILM X-T1 & XF50-140 lens) definitively helped! 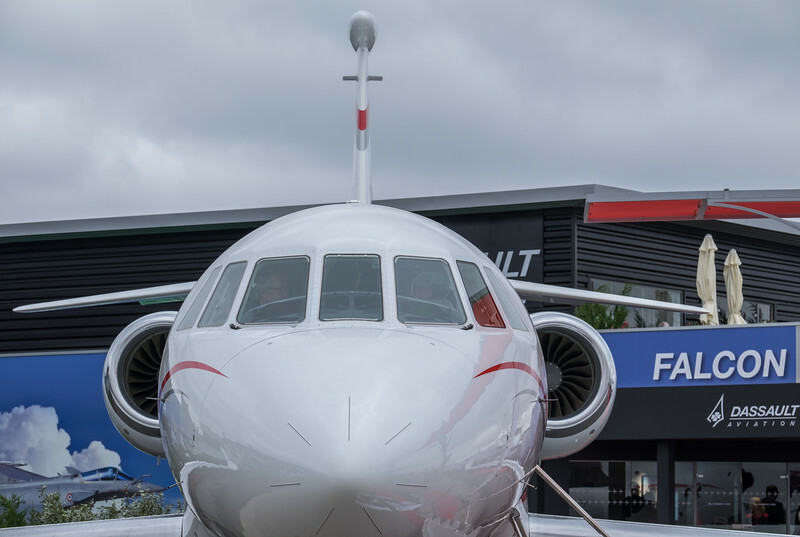 The Paris - Le Bourget airport, where the show has been held since 1953, is also the home of the "Musée de l'Air et de l'Espace", one of the worlds greatest Air and Space museums. A gallery with images I shot at the museum earlier this year, can be found here. 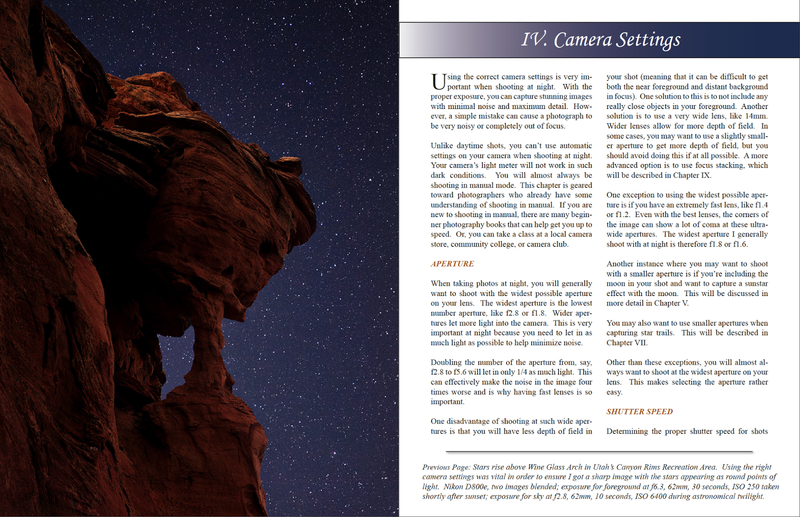 Yesterday I reviewed Collier's Guide to Night Photography; likely one of the best (e)books on shooting the night skies! The image consists of just over 1 hour of 30sec exposures to create the star trails and a single frame for the foreground. As I'm not 100% happy with the blending of the foreground image with the star trails, I will likely rework the image some more over the Summer months. Comet like Star trails made in Photoshop CC using the technique explained in Collier's book above. More of my "Nature of the UAE" images can be found here. 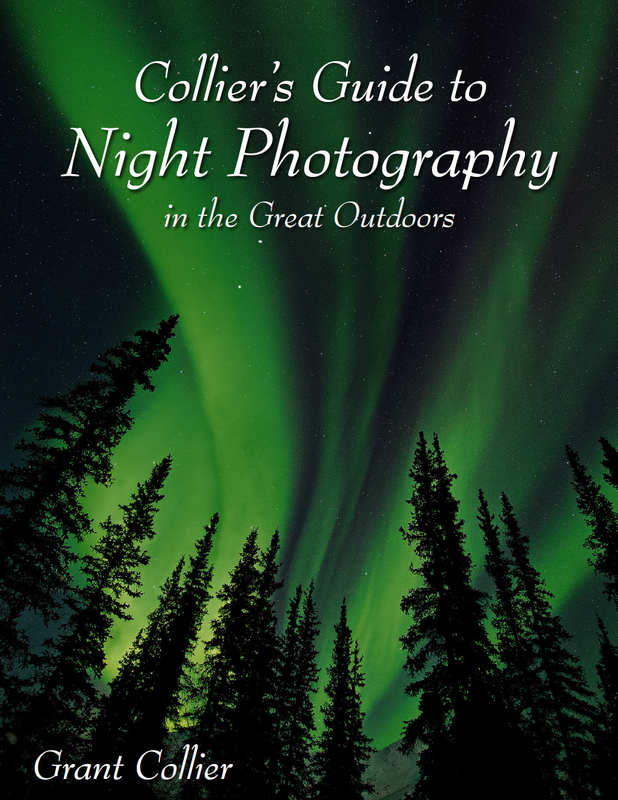 Remember: "The sky is filled with stars, all invisible by day"
Last month, I was approached by renown US photographer Grant Collier, with the question whether I would be interested in reviewing his latest (e)book, "COLLIER's GUIDE to NIGHT PHOTOGRAPHY in the GREAT OUTDOORS". The question could not have come at a better moment, as I was just to embark on doing some more night sky photography in the Dubai desert, before the soaring Summer temperatures make it impossible! 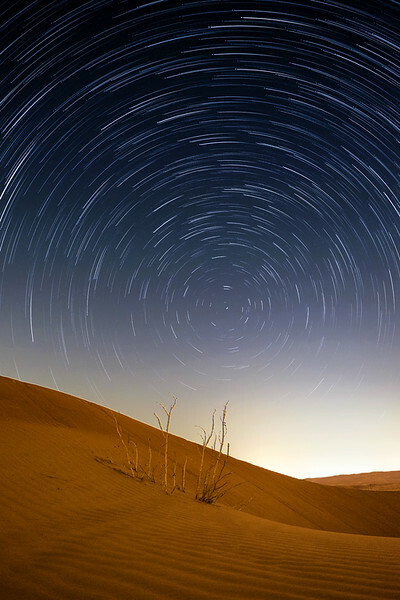 Grant is no newbie when it comes to photographing the night sky... With over 12 years of experience in this specific kind of photography, he shares plenty of little gems which a lot of photographers would have never heard of. 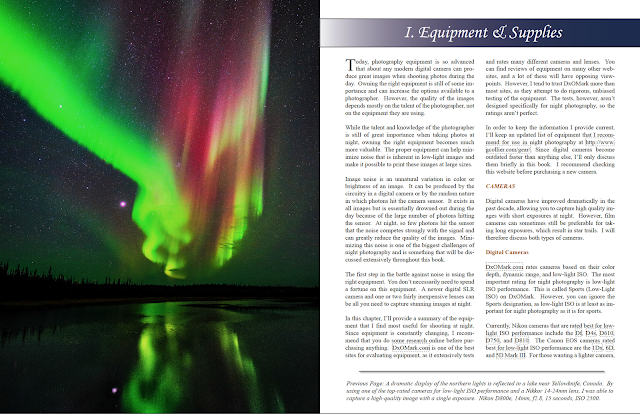 Something I really like about this book, is the fact that is it not written for the complete spectrum of photographers. 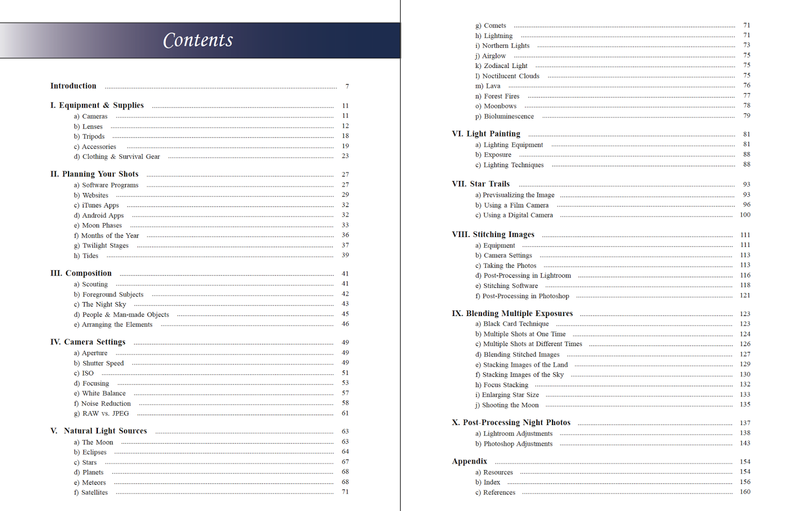 For all you newbies who struggle to see the difference between an aperture and a shutter speed or don't know what a layer mask in photoshop does, this book is probably not for you! Explains both film and digital cameras, best lenses to be used and its accessories such as filters, tripods and ballheads. Beside there is a nice overview of the clothing and survival gear one should consider when going into the wilderness! 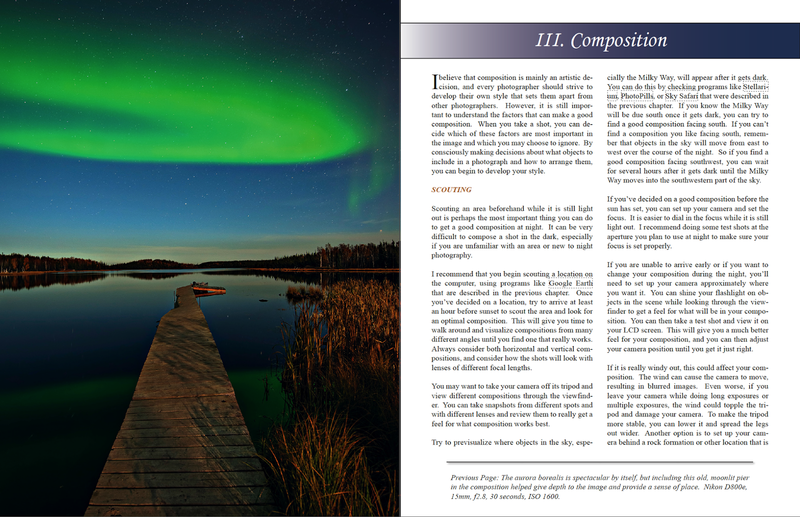 Several pages, are filled wit tips and techniques to prepare for a night photography shoot. A large range of desktop and tablet/smartphone applications are discussed, as well as a month by month overview of what will stand out in the Northern hemisphere night sky. 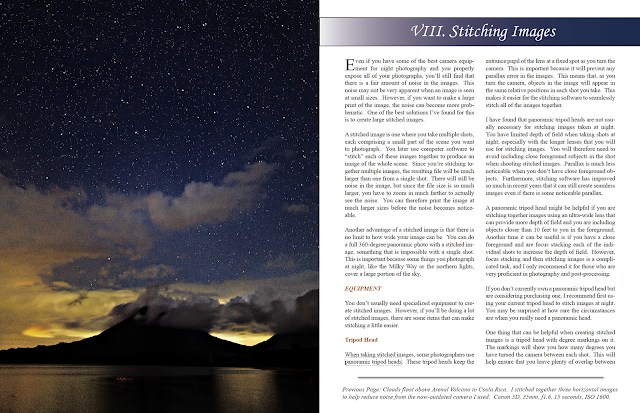 Classic composition techniques applied to photographing the night sky and the challenges that one will encounter. It is a relatively short chapter concentrating on what to include or avoid in the foreground and background. Excellent practical explanation of things like hyperfocal distance, how and when to use infinity manual focus but also what shutter speeds work best use for specific night images. Starts with how we can use moonlight to our advantage; how to shoot eclipses; and also a great paragraph about Northern light photography. 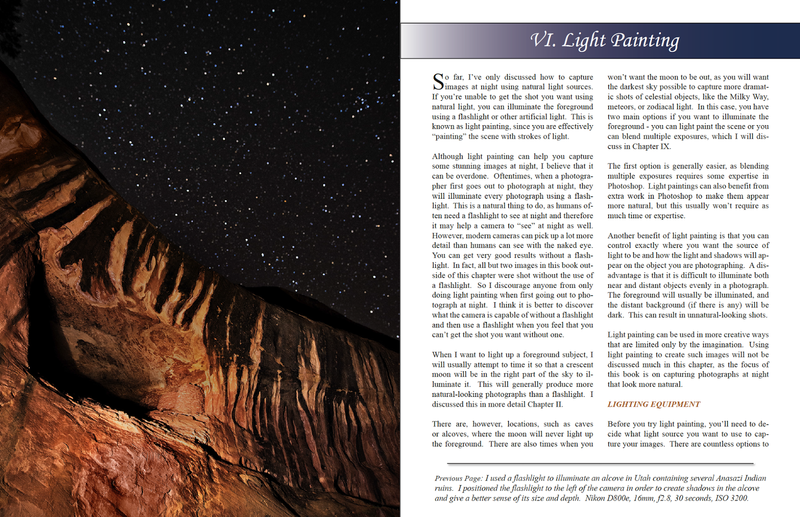 The chapter concludes with some special light sources such as; forest fires, lava fields and moon bows. Exciting stuff! 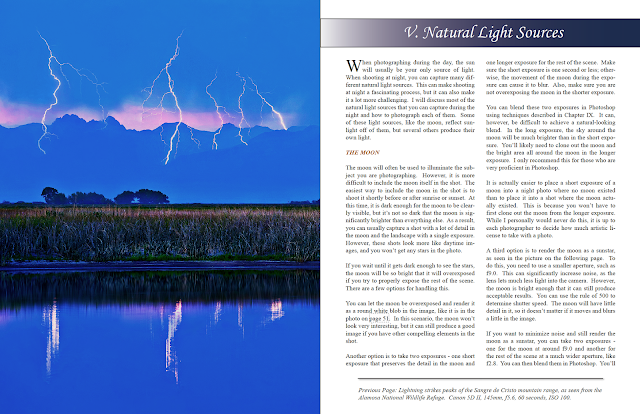 When photographing the night sky, most photographers will not immediately think about light painting, (using flashlights and LED light panels to illuminate the foreground), but there is definitively a place for it! Some great examples of the above can be found in this chapter! Likely the number one item photographers will think about in photographing the night sky. 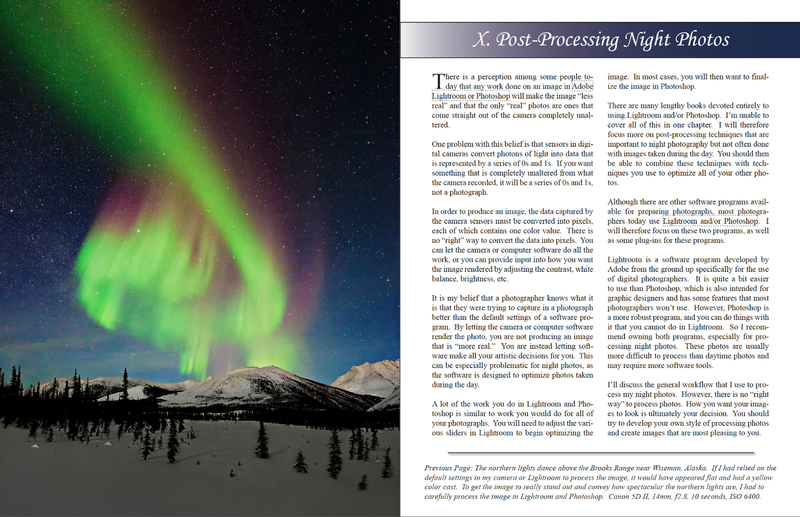 Several techniques are explained, being shorter images blended together in software or longer single exposures. 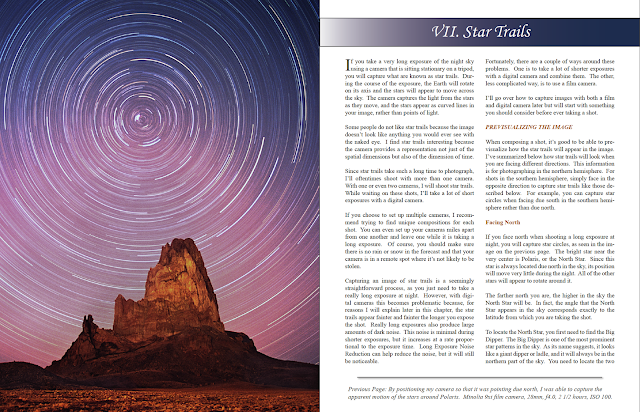 Have you ever seen images where the star trails look like comets? Well Mr Collier explains how it is done here! Not something I have tried in my night photography, but looking at the examples in the book, it is clearly the way to go! The explanations are not limited to photoshop but lists several other good (better?) options. Pretty much the only way, one can creative these spectacular images were both foreground and night sky are properly exposed. 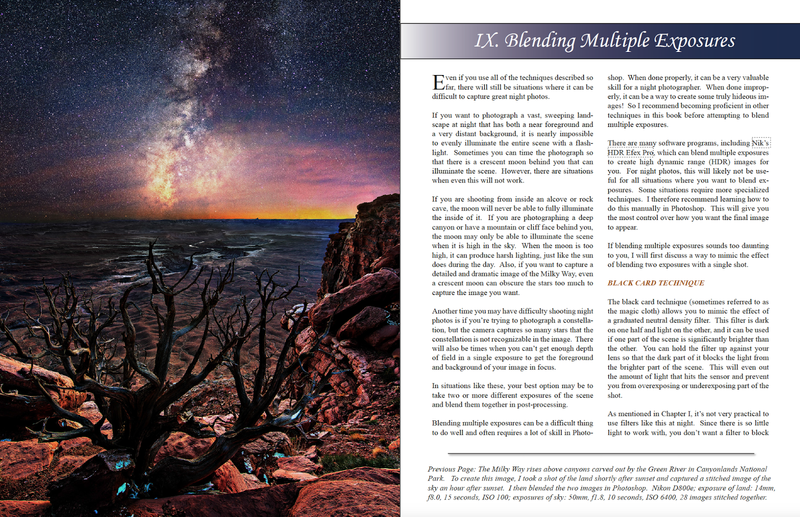 The last chapter of the book, is where I personally learned the most... Grant explains what the post-processing limits are within Lightroom, but then moves into more complex tasks such as the use of Luminosity masks. In this chapter he explains how he uses "Tony Kuyper's" luminosity masks in Photoshop. As this is an editing technique, I've been wanting to learn for some time, I did finally buy Tony's TK Action panel together with "The complete Guide to Luminosity masks" video series by Sean Bagshaw; both availavle at the goodlight.us website. But, it looks like Grant Collier is also selling a +7 hour post-processing video series dedicated to post-processing. Even though I have not had the opportunity to watch it, these will likely fill in the gaps of the book! Overall I rate this book a 9 out 10! I have several books on night photography and this one is clearly the best of them all. The 160 page book is available as a signed paperback copy for 29.95,-USD or 18.95,-USD for the eBook version. Both can be purchased here. Browsing through the ebook in two page full screen mode, on a large 27inch monitor, makes for a great viewing and reading experience! It has clearly boosted my urge to do more night sky photography, but due to the soaring Summer temperatures and humidity here in Dubai, this will have to wait till end of September. This weeks Pic(k) of the week, is a "star trail" photograph, where I used some of the techniques I learned in Grant's book! Expect the image to be online by tomorrow. Last month, I spend some time in prison, well kind of... 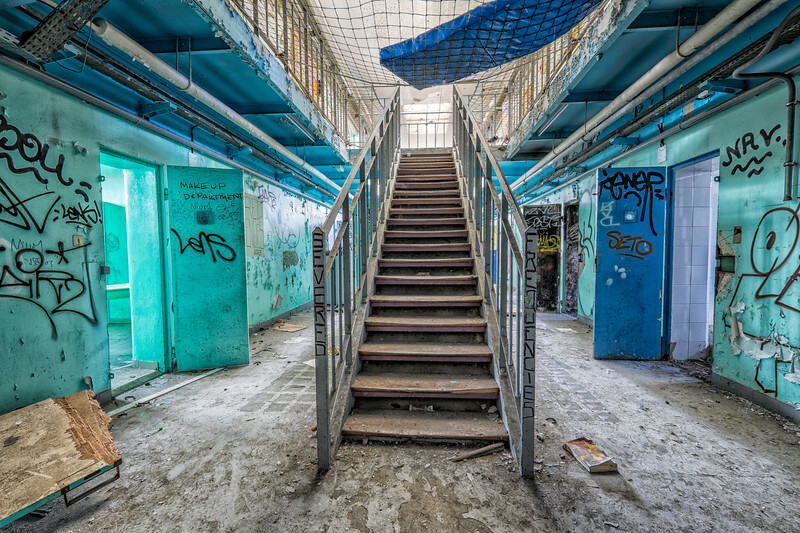 Originally an abbey, the H-15 prison in Loos, part of Lille (France), has been deserted since early 2012 and has since become a popular spot for Urbex (Urban Exploration) photographers from all over the region. 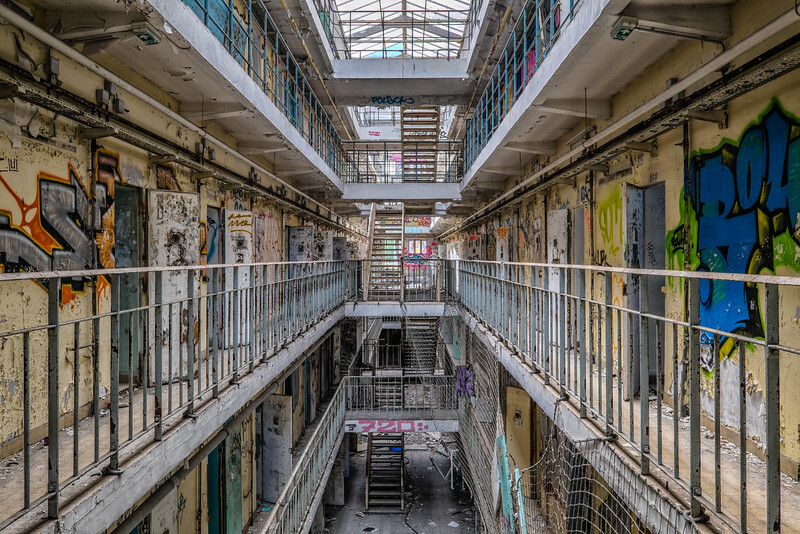 I guess all prisons have kind of a mysterious feel to them, but since it was a very windy day, the sound of cracking roofs and slamming doors definitively added to the overall spooky atmosphere! 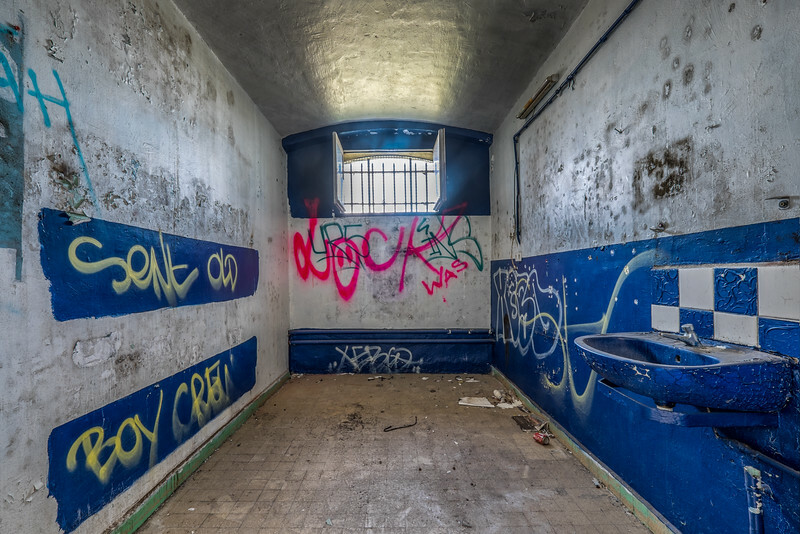 Even though I didn't see anybody else while I was there, looking at the amount of graffiti, I was clearly not the first one to visit the penal institution since its closure date. 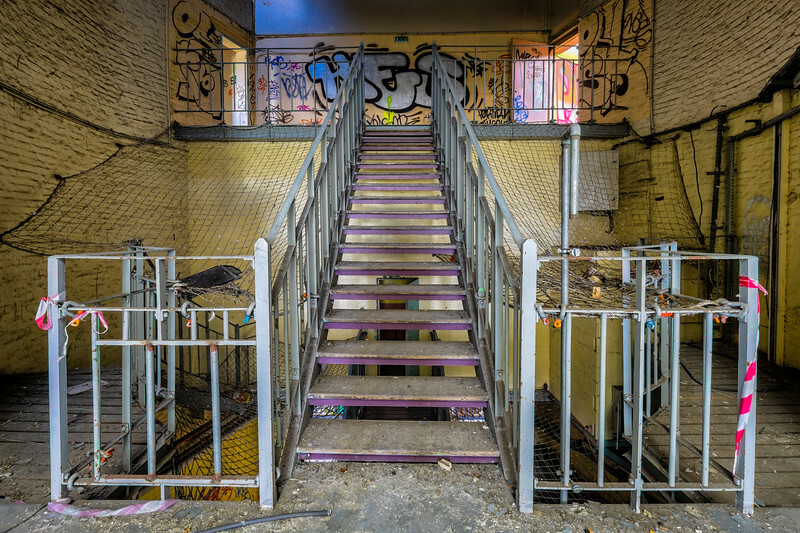 As often is the case for Urbex photography, the roughness of the scene, makes for great HDR (High Dynamic Range) images. In order to be mobile and fast moving, a lightweight mirrorless camera system, was definitively the way to go! 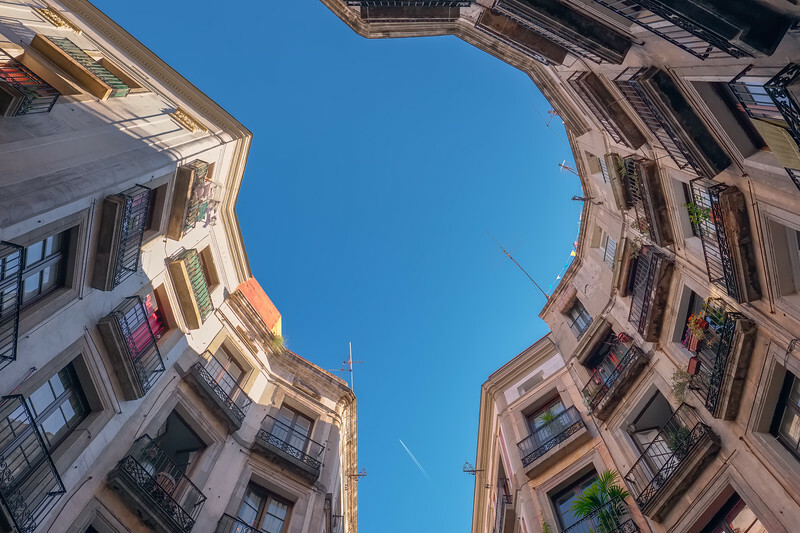 All images were made with the trusty Fujifilm X-T1 and the Fujinon 10-24 f4 wide-angle lens. 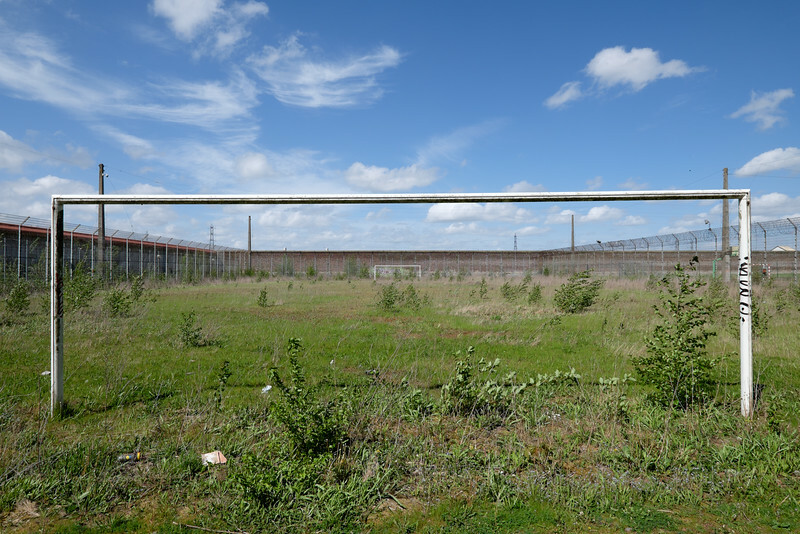 One of my favourite images shot outside, was the one below of the prison's football pitch which was clearly in need for some grass-cutting. 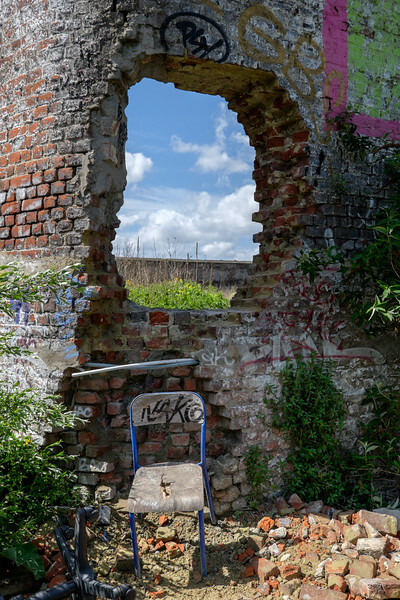 For more images of Lille; the 5th largest metropolitan area in France, click here, and more Urbex photography can be found here. 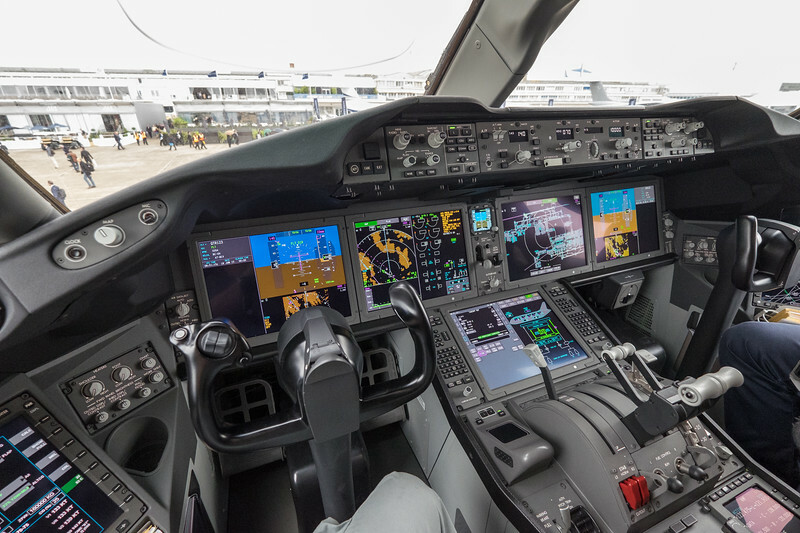 When I travel for the day-job (airline pilot), my stays are often limited to 24hrs. 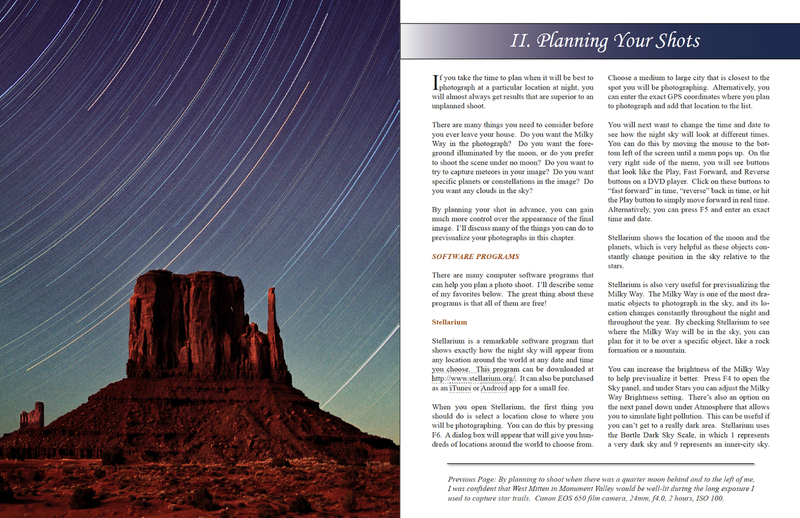 In order to maximise my photography, I strongly believe in planning ahead by doing online research. While I've pretty much been to most of the popular sites in Barcelona, I discovered a few online images of what looked like an interesting street; "Carrer de Milans", just West of Barceloneta. Even though I got there just before sunset, the dynamic range (difference between the shadows and highlights), was still very high. As I didn't want to make an HDR (High Dynamic Range) image, by the typical bracketing of several exposures, I decided to try and capture as much date as possible in a single RAW file. It keeps surprising me how good the dynamic range of the little Fujifilm X-T1 sensor is! As much as I like the Fujifilm jpeg film simulation modes, I personally believe there is definitively still a place for shooting RAW format for the more demanding dynamic range images. As I wrote some time ago, I've been experimenting with Iridient Developer for editing my RAW files. Opening the full dynamic range with Iridient is more demanding than in Lightroom, but when it comes to shadows and highlights, the end result, is pretty much the same. Details and sharpness in the more demanding areas, are definitively better with Iridient. For the ones that are stil not convinced about the potential of shooting in RAW, below is the comparison of the before (straight of camera RAW) and after (final image) shot. Click on the image for a better view. 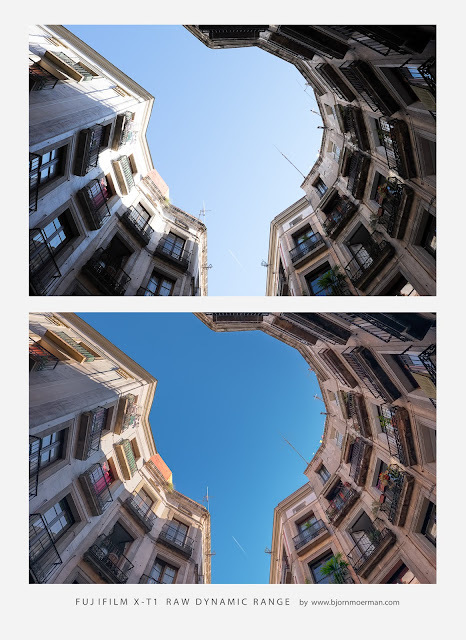 My review on the brand-new Fujifilm XF 16mm f1.4 lens can be found here, while more of my Barcelona images live here. Working on personal projects is "the" key to keep the creatives juices in one's photography, flowing! While waiting for the sun to go down in the Dubai desert for an upcoming startrail shoot, I got fascinated by the different patterns in the sand dunes. Since then, I've been back to the desert several times, to specifically look for "Sandscapes", clearly not an official word but neither something I invented myself... Obviously influenced by the world "landscapes", over the years photographers started using variations like cityscapes, seascapes, etc... Sandscapes is just an extension of this list. The image below is a triptych of three images that made it into the new "Sandscapes" gallery. 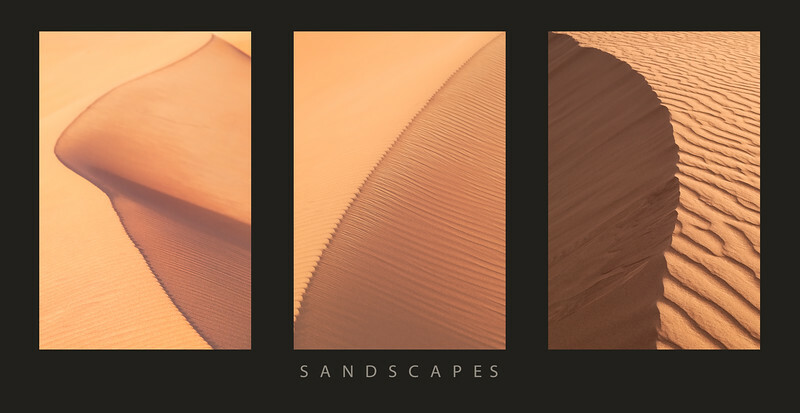 The new Sandscapes gallery can be found here and is clearly a work in progress. Remember to "Write your worries in sand and carve your blessings in stone"!